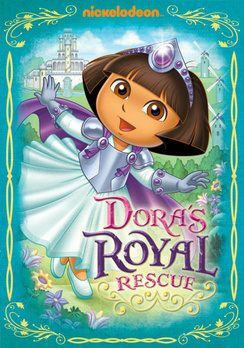 New on DVD- Tuesday October 2, Lady Knight Dora is joined by Don Quixote in her brand new and exciting quest in “Dora the Explorer: Dora’s Royal Rescue”. The film features the talented voice of Andy Garcia as Don Quixote and Placido Domingo as Malambruno. In this epic journey Dora and her pal Boots with the help of his horse Rocinante are trying to help Don Quixote who has been locked away in a Story Castle by the evil Malambruno. The DVD features an additional story called “Dora’s Knight Adventure” where Dora has the chance to become a knight herself. If your child is a Dora fan, or you know someone who is, this is the perfect DVD to add to their collection. Created by Nickelodeon Home Entertainment and distributed by Paramount Home Media Distribution, Dora the Explorer: Dora's Royal Rescue will be released on DVD Oct. 2, 2012 for the suggested retail price of $14.99.